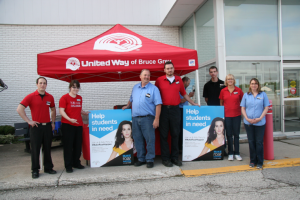 Syd and his team have gone above and beyond for the United Way of Bruce Grey since we partnered with them way back in 2008. We didn’t even have our fancy red tent to set up beside the bus back then! But we did have the crew at Staples. They’ve done just about everything for us! Copying donation forms, printing off extra shopping lists, letting us use their washroom (that one is essential on long days with the bus). More importantly, Syd and the staff truly helped. They asked every customer if they’d like to make a donation while checking out. We raise thousands of dollars with the cashiers every year that wouldn’t be possible without if they didn’t ask. They give us the best possible price while buying school supplies, so we can use donated funds as efficiently as possible. And this one is the best: they let us park a giant school bus in front of their store for a week, every single year! Since partnering with Staples in 2008, the Backpack Program has been able to provide a backpack and school supplies to more than 22,500 students in Bruce Grey. 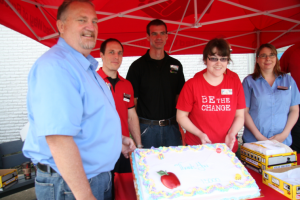 We’ve been able to celebrate the 10,000th, 15,000th, and 20,00th backpacks stuffed with Staples (and cake, of course). The first year of the program in 2005 resulted in 250 students getting help. In 2008, our first year with Staples, we stuffed 1,639 backpacks! Now in 2018, we’ve fulfilled 2,455 requests for students in need across Bruce and Grey County. We wouldn’t have been able to do it without their help and we look forward to 2019! Backpack 25,000 is right around the corner, and we’ll be sure to bring cake.